When you think about bridesmaids, the concept seems really old-fashioned. And there are probably countless stories of bridesmaids feeling abused by their beloved bride as she cracks under the pressure of planning the #BESTDAYEVER. And thankfully, all of that seems to be changing. 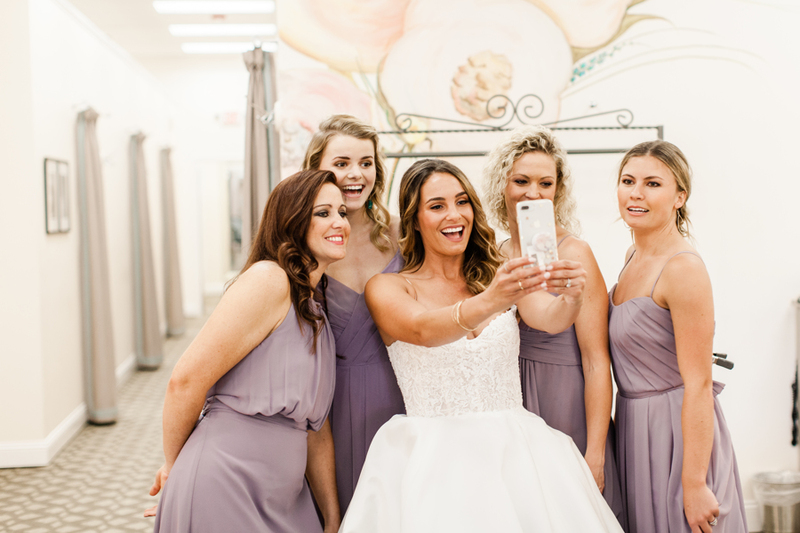 Maybe it’s the new Millennial way of doing things, but we’ve seen more and more brides doing as much as they can to celebrate their girls throughout the wedding planning process, as much, if not more than they are celebrating her and her future marriage. It’s heartwarming, really. We love the idea so much, we put together a styled shoot with Ashley of Ashley Helen Photography to demonstrate the type of things we’ve been seeing in the last year or so. 2.) It created memories for this sisterhood of women that they would cherish forever- long after the cake’s been cut and the shoes tossed to the side of the dance floor. At MD, we feel a strong sisterhood with our brides, whether they were married in 1989 or are getting married in 2019. 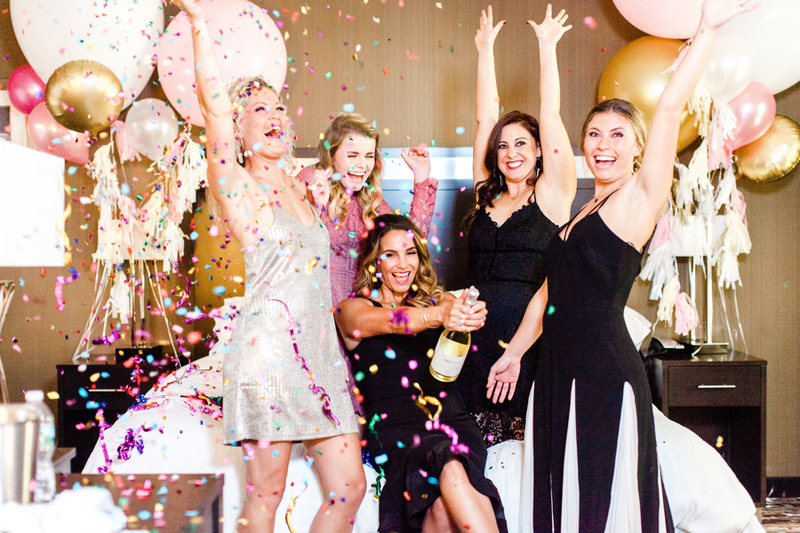 Celebrating women is what we do and this shoot was a fun way to demonstrate how our brides are celebrating their best babes, too. We hope you enjoy it! Our gorgeous paper good suite was designed by Fink Prints and included not only the invitation, but a detailed itinerary, menus and of course a super cute “Do not disturb” door tag. Our fiction group of #BRIDESBABES stayed at the Hampton Inn at Portwalk Place in downtown Portsmouth. Their outfits (for the entire weekend) were styled by Mint Boutique. Make-up Styling was by the incomparable Joanne McDonough of Joya Beauty and hair by the oh-so-fun and talented Alana Parsons of Fringe Hair Studio. Naturally, there was a constant flow of champagne throughout the weekend. And naturally, the bride had fabulous gifts waiting for her girls. How stunning were these gift boxes from Lux Box Co? Whatever the occasion, they probably have a box that’s suitable, but naturally ours was custom-designed for our bride. Our brides are about so much more than just their wedding planning. They are active, interesting women. So a weekend getaway for them and their girls would naturally involve something to keep them healthy in body, mind and spirit. A yoga session on Four Tree Island led by Jenn from Barre & Soul was the perfect choice. Yoga was just the start of their many activities that day. After reviving their bodies and minds, they switched gears and enjoyed a luxurious private shopping appointment at Madeleine’s Daughter so the girls could choose their bridesmaid dresses. And of course we had to give them a sneak peek of the bride’s wedding gown! Once the main task of the weekend was complete, the rest of their time in Portsmouth was dedicated to shopping, eating, drinking and celebrating. 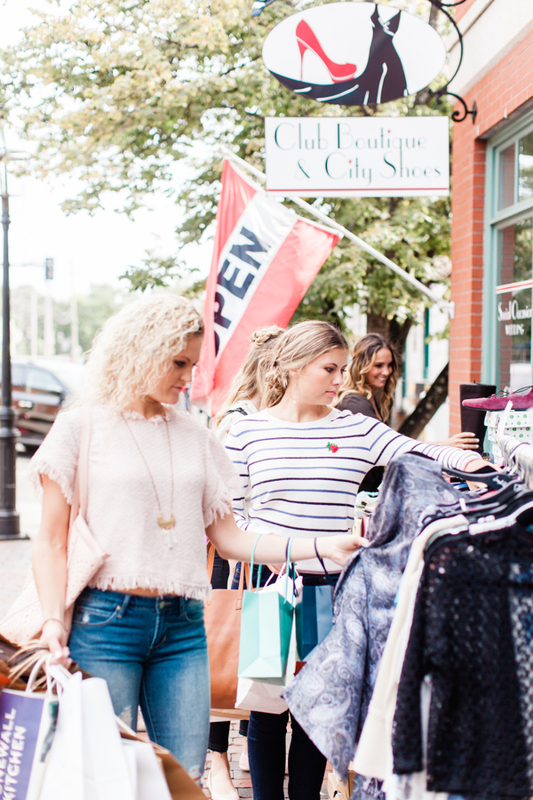 They visited multiple shops and restaurants downtown including Cava, Moxy, Maison Navarre, Mint Boutique and many other quintessential spots. Despite their busy day, these girls were able to rally, and get dressed up for a night out on the town after all their shopping around town. Hotel décor was styled by Nicole Mower Weddings & Events. Seriously, how fun are those balloons?!? What better way to finish the weekend than with a perfectly elegant “Farewell Brunch” at the Martingale Wharf? Nicole Mower Weddings and Events styled our beautiful brunch with help from Mellow Botanical, BBJ Linen and Exeter Events & Tents.